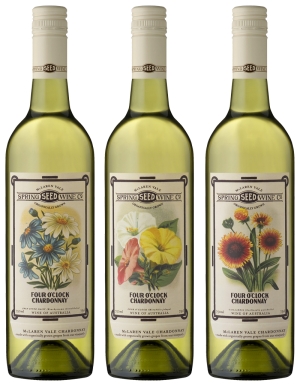 Spring Seed Wine Co produces the Forget-me-not Sauvignon Blanc Semillon, Poppy Pinot Grigio, Four O’clock Chardonnay, Sweet Pea Moscato and the Morning bride Rosé. 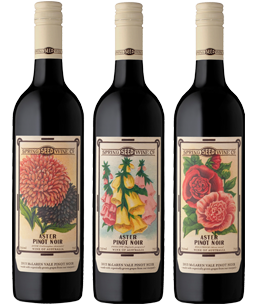 We produce three red wines – the Aster Pinot Noir, the Sweet William Cabernet Sauvignon and the Scarlet Runner Shiraz. All of these wines are made using grapes from our organically certified vineyard. 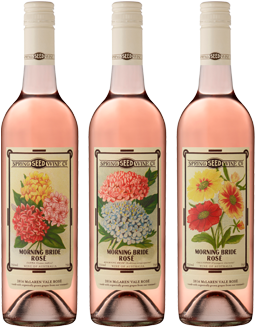 The Spring Seed Wine labels are unashamedly inspired by vintage flower seed packets created at the turn of the last century. The colour, clarity and beauty of the original seed packets are quite remarkable. 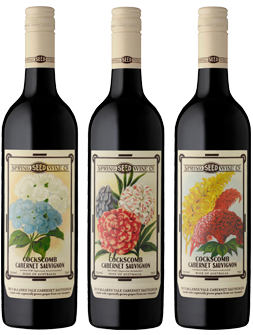 We chose three different flower images to adorn each one of our McLaren Vale wines (apart from the sparkling wines) simply because they are quite lovely. The old-fashioned look of the seed packets (and our labels), and the painstaking attention to detail involved in the creation of the original artwork resonates clearly in the traditional, meticulous practises we employ in both vineyard and winemaking.